Somewhere under the heading of “hidden in plain sight” is a remarkable Oregon white oak (Quercus garryana) growing just a few yards from the Historic Columbia River Highway, near Rowena Crest. I stumbled across this old sentinel a few weeks ago while exploring the sprawling fields of arrowleaf balsamroot that Rowena is known for. 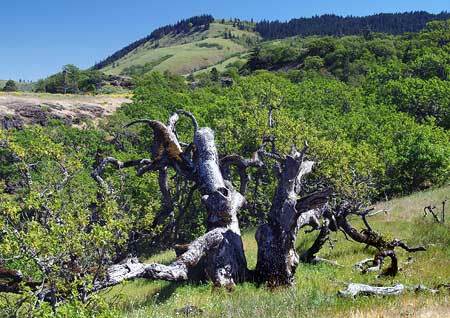 The venerable Rowena oak is not a particularly graceful tree: you won’t find it in coffee table books or on postcards. 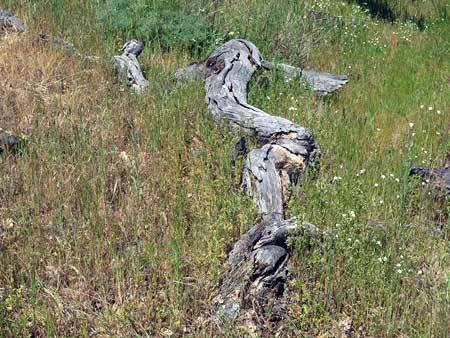 Though the gnarled trunks of these slow-growing trees are often living works of art, the Rowena oak is as much a battered monument to simple survival as it is a living sculpture. But it’s well worth a visit for anyone who loves ancient trees, and makes for a unique stop for those exploring the old highway. The tree is located in a most unlikely spot, near the brink of craggy Dry Canyon, a Missoula Flood feature that is part of the Rowena Dell canyon complex. 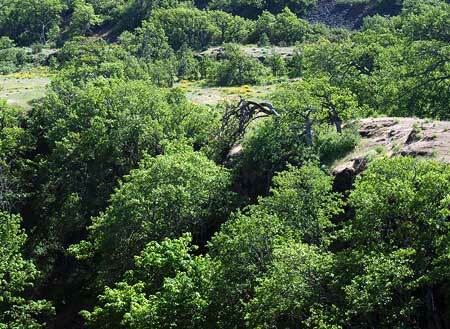 The sheer canyon walls are a reminder that the oaks surviving the harsh Rowena climate are anchored in a very thin layer of soil, atop hundreds of feet of layered basalt. This semi-desert ecosystem has an average of just 14 inches of rain per year, with hot, dry summers and freezing winters, and our infamous Gorge winds ready to strike up at any time, year-round. The fact that Oregon white oaks can live to be hundreds of years old in this environment is truly remarkable. Part of their secret lies in a large taproot that not only anchors the trees in this windy, hostile environment, but also provides trees access to deep groundwater stored in the layers of basalt bedrock. The main taproot in these trees is complemented by a strong lateral root system, giving our native oaks an especially impressive root structure compared to most other tree species. Despite these challenges, the oak trees of the dry savannah found at Rowena are thriving, and even the ancient sentinels in these groves are blooming and producing acorns with each spring. The Rowena Oak grows just a few yards from the historic Dry Canyon bridge, and was clearly here to witness the construction Samuel Lancaster’s Historic Columbia River Highway and Conde McCullough’s iconic highway bridge over the rocky gorge in 1921. The old tree probably stood witness to first railroads being built in the late 1800s, as well — and the rise and fall of the salmon canning industry that swept through the Gorge toward the end of the 1800s. In fact, at roughly two feet in diameter, the Rowena Oak could easily pre-date the arrival of Europeans in this part of North America. An Oregon State University (OSU) study of similar Oregon white oak habitat in Southern Oregon found that trees greater than 15″ in diameter were consistently 200 years or more years in age. The oldest oak in the OSU study was a whopping 429 years old, truly a testament to survival. 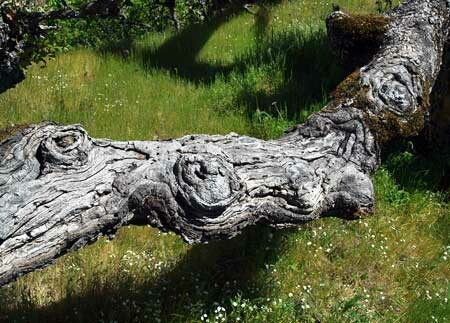 The arid climate at Rowena may be tough on trees, but it also helps preserve the life history of the old giants as they gradually succumb to the elements. Their broken tops and limbs are often preserved exactly where they fell decades ago, as mute testimony to the years of hardship these ancient trees have endured. 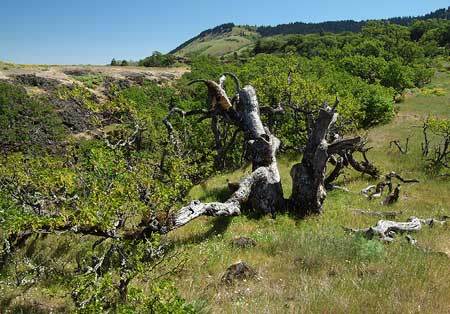 The Rowena oak is a great example, as it is surrounded by its own debris from decades of the ice storms, relentless winds and even the occasional lightning strike that are part of survival in the Gorge. The density of Oregon White oak wood helps in the preservation, as well — the same hardness that preserves its wood in the wild is also why these trees have historically been used to make furniture, flooring and barrels. 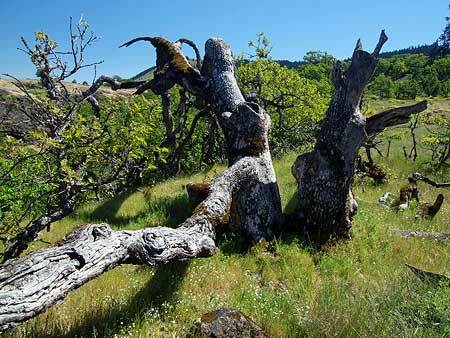 The Rowena oak has huge, twin trunks, the top of each toppled long ago by the elements. Lacking a top, the tree relies on four massive, sprawling limbs to survive, highlighting another survival secret of this species: Oregon White Oak sprouts prolifically from dormant buds on stumps and along trunks when tops are cut or broken off. This ability to adapt helped the Rowena oak survive what could have been catastrophic damage for most tree species. The eastern of the two trunks points two massive, arching limbs toward the rim of Dry Canyon, and a closer look reveals yet another survival secret of this ancient tree: a tangle of branches cascade over the cliff like a leafy waterfall, with a lush canopy protected from the worst of the Gorge weather that sweeps across the top of the plateau. A third major limb, nearly a foot thick, snakes a surprising 50 feet from the eastern trunk, along the exposed cliff edge of the canyon. This huge limb hovers just 2-3 feet above the ground — yet doesn’t touch — thanks to the tremendous strength of its wood. The huge, contorted limbs of the Rowena Oak have “eyes” that seem to be watching curious visitors! The western of the two main trunks has just one surviving major limb, a crooked, cracked affair that touches ground at several points, surrounded by the bleached bones of its own branches, broken off over the decades. Each of the fracture points in this broken old limb is marked with a thicket of new sprouts, showing how this old tree continues to regenerate, extending its long life. 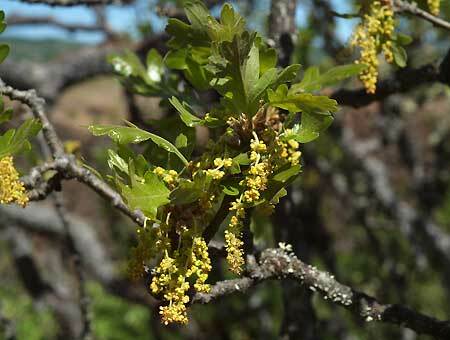 While the Rowena Oak may look haggard, its growing limbs are healthy, putting out annual bursts of new leaves each spring, along with surprisingly abundant flower clusters. These will soon yield acorns, completing a reproductive cycle this tree has likely repeated since the time when Lewis and Clark passed by, if not longer. 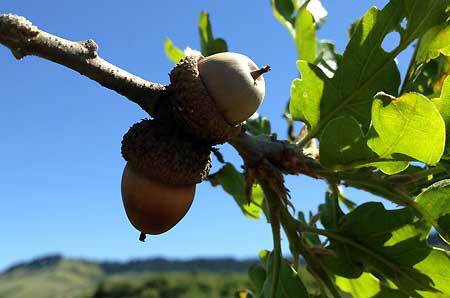 Though most have been stripped by the elements or wildlife, several acorns from last year’s crop are still attached to the Rowena Oak, waiting to be dispersed. A mature Oregon white oak can produce anywhere from 20 to 50 lbs of acorns in a season, depending on growing conditions. Acorns may look tough, but they are designed to sprout new tree seedlings as soon as moisture and warmth allow, as the seeds only remain viable for a year or so. Only a very few will sprout, and only a tiny fraction of seedlings will survive to become trees. The thickets of younger Oregon white oak trees we see in some parts of the Gorge today may be the result of fire suppression over the past century. 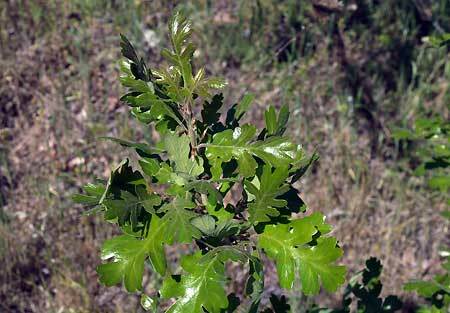 Studies of Oregon white oak groves in the Willamette Valley by Oregon State University suggest that pre-settlement fires regularly thinned out seedlings, allowing established oak trees to thrive without the competition of young oaks. Fire also kept other, competing tree species at bay that otherwise would have crowded out the native white oaks. Though the spectacular fields of yellow balsamroot and blue lupine have mostly faded, Rowena is always fascinating to explore. The Nature Conservancy owns and manages a sizeable conservation preserve covering much of the area. A lower trail leads across the Rowena Plateau to a cliff-edge view of the Columbia River, and an upper trail climbs to McCall Point to a sweeping view of Mount Hood and the Gorge. 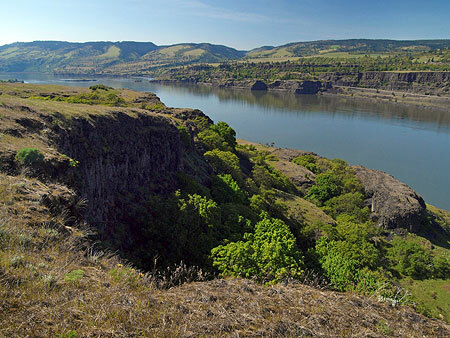 Less adventurous hikers can still enjoy terrific views of the Gorge by simply hiking the first quarter mile or so of these trails, so there are hiking options for every ability. The Rowena Oak is located just a few steps off the Historic Columbia River Highway, immediately west of the Dry Canyon Bridge. 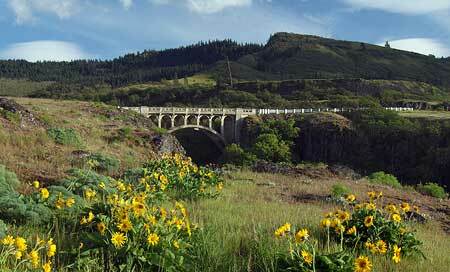 Roadside parking is available as you approach the bridge from Mosier. Simply walk uphill along the west edge of the canyon, and you will immediately spot the old oak from a low rise adjacent to the highway. This is an easy, rewarding stop for families with young kids, as the tree tells a fascinating story of survival. The longer hikes to the Rowena Plateau and McCall Point are quite busy during April and May during the wildflower bloom, but you’ll have them to yourself later in summer and fall, when the flowers are gone but the landscape is just as impressive. While the upper trail leads to broad views of the Columbia River and Mount Hood, the lower trail has a unique pair of “kolk” lakes formed during the Missoula Floods, and equally impressive views of the river and Rowena Dell. As with all eastern Gorge hikes, use caution hiking in the heat of summer, as there is little tree canopy to shade these trails. 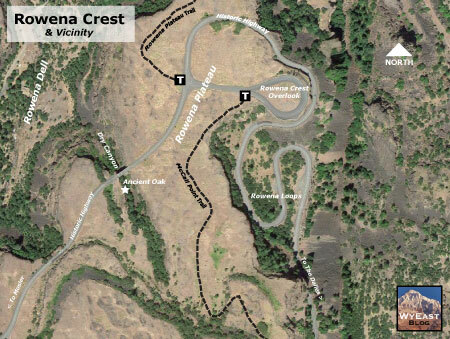 The Nature Conservancy also asks that you stay on the trails, and be aware of the triple hazard of rattlesnakes, poison oak and ticks that are standard for the eastern Gorge. The first two in this list are easy to avoid, but you should prepare for ticks, and follow more rigorous precautions (see this recent article on ticks for a few tips). Note that the trails at Rowena are closed in the winter, when they can be slick and potentially hazardous. In late spring across the arid mountain west, sunny slopes and open Ponderosa forests explode with bright yellow drifts off Arrowleaf balsamroot (Balsamorhiza sagittata), the native sunflower of the western states. These handsome plants are especially abundant along the dry east slope of the Cascades, where they are also known as Oregon sunflower. The name “Arrowleaf” describes the large, felted leaves of this plant — though in size they are closer to a spade than an arrowhead, often as much as a foot in length. “Balsamroot” refers to the fist-sized, branched taproot that anchors these plants in their typically windswept, harsh environment. The roots have a strong, pine-scented (or “balsam”) sap. These oversized roots not only draw moisture from deep in the arid soils in which Arrowleaf balsamroot grow, but also allow the plants to easily survive fires. The flowers are actually complex collection of individual blossoms that give the illusion of a single, large flower head. The outer ring of “petals” emerge from dozens of individual florets, each producing one enormous petal that combine to form the ring of yellow petals. A close look at the developing flower head (below) shows these emerging super-petals as a fringe of green tips. Native Americans used almost all parts of these plants for food. Tender shoots and leaves were eaten raw or steamed, and immature flower heads were peeled and eaten. The sunflower-like seeds were eaten dry, or roasted. The roots, which are bitter when raw, were cooked and ground into a meal that was used to make cakes, and dried and powdered to make tea. The plant was also used for medicinal purposes, with green leaves used to treat burns and the boiled roots used to create a medicinal salve for small wounds. A tea made from the roots was used to treat respiratory ailments. Balsamroot is still used today in organic foods and herbal medicines. Wildlife also depend on Arrowleaf balsamroot. The plants are tolerant of browsing by deer and elk, and the seeds are important forage for small mammals, such as the Columbia ground squirrel. Wild horses graze on the plants in spring, and are especially fond of the flowers. The plants are also grazed by domestic stock, though they are sensitive overgrazing. 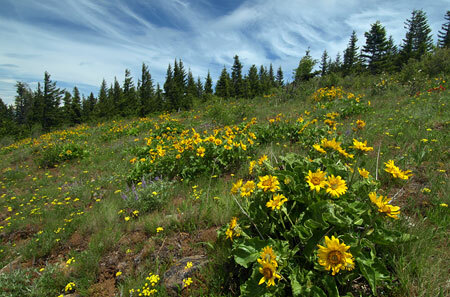 In the right conditions, Arrowleaf balsamroot grow to fill whole mountainsides with their spectacular blooms. 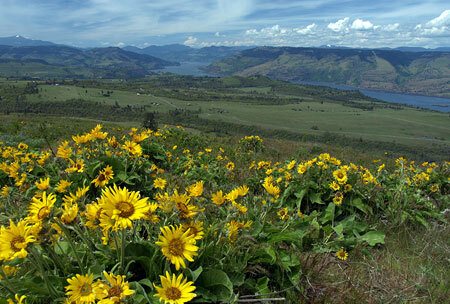 As the blooming season of Arrowleaf balsamroot peaks in late April or early May, the Columbia River Gorge provides one of the finer displays anywhere. Blue lupine is a frequent companion plant, providing a painting-perfect complement to the displays. 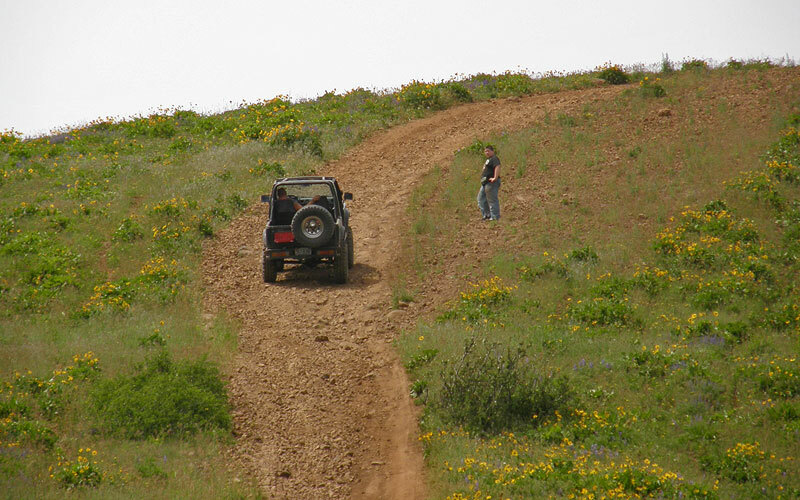 You can visit some of these spectacular displays by exploring Gorge hiking trails at Dog Mountain, Catherine Creek, Rowena Crest and Dalles Mountain Ranch. 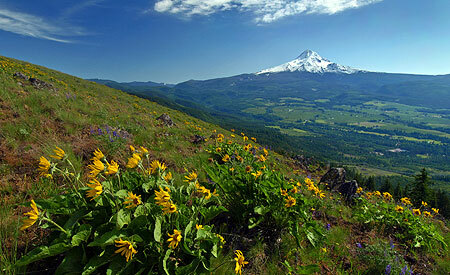 Check out the Portland Hikers Field Guide for more information on these destinations. 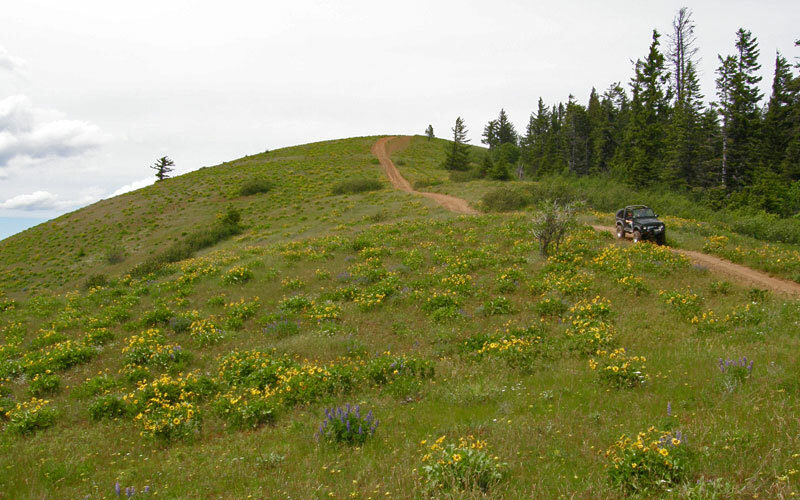 These fragile slopes on Hood River Mountain -- covered in their spring blanket of yellow balsamroot -- were recently scarred with a driveway to yet another ill-conceived trophy home. One of the great tragedies of the Columbia River National Scenic Area Act (signed into law on November 17, 1986) was the crude delineation of what should be protected and what should not. The official boundary was eventually determined by pulling in terrain that could be viewed from the river, and from a scenic resources perspective, this was a fair starting point. But the flaw in this thinking is that nature rarely follows clear boundaries, and some of the most precious lands in the Gorge were excluded by virtue of being hidden from view. It’s times to correct that oversight. It was also automobile-centric, since gorge visitors on foot, bicycle or horseback are likely to visit the high points and overlooks that have a broader viewshed. This map shows how the scenic area boundary excluded the unique, open slopes of Hood River Mountain shown in the previous photo. One such area is Hood River Mountain. 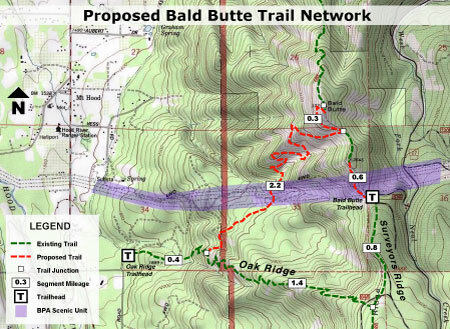 Hikers flock to the area, though few realize that they’re hiking on private land (despite a sign stating so). Still fewer know that the land they are hiking on has no protection from the Columbia River National Scenic Area, though the Columbia River can be seen below. Without Oregon’s strict statewide planning, this area would be maze of roads and trophy homes by now. 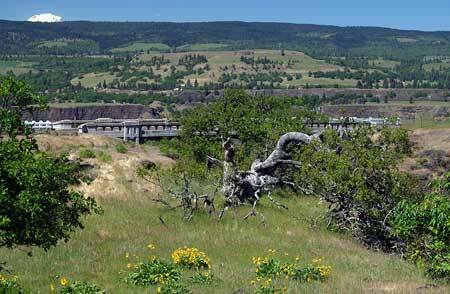 Instead, the mountain survives largely intact, in big parcels owned by a Washington timber company. But not all of Hood River Mountain was spared. The northern extent had already been divided into smaller parcels by the time Oregon’s planning laws were enacted in the 1970s, and today these parcels are in high demand for trophy homes. The dwelling pictured at the top of this article was recently constructed on one such parcel, scarring the mountain forever with a quarter-mile driveway. This gouge across the delicate sloped meadows of arrowleaf balsamroot threatens to destabilize sensitive soils, placing an important ecosystem at risk. 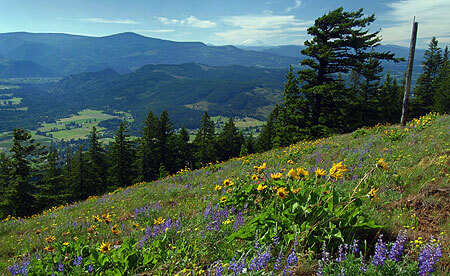 The sprawling meadows on Hood River Mountain are owned by a (so far) benevolent timber company, but are on the wrong side of the scenic area boundary for the purpose of public protection. 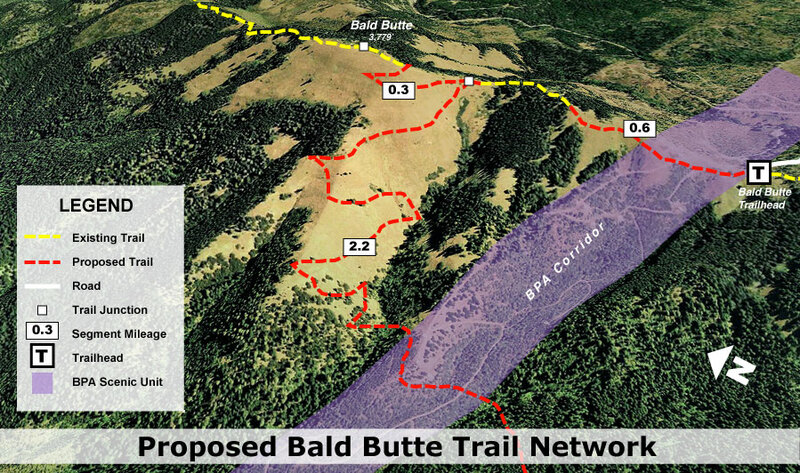 This development on the northern tier of Hood River Mountain is a jarring reminder that in the short term, the scenic area boundary must be revisited to identify rare or endangered ecosystems, or other important resources that abut the line. Adjusting the boundary in these areas would open the door to federal protections and public acquisition of these sites over time. In the long-term, the more difficult question of acquiring and either removing, or re-purposing some of the more egregious trophy homes must be addressed. 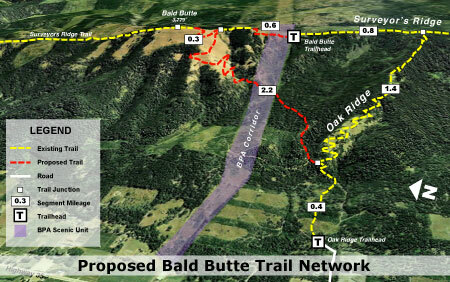 The Forest Service has rarely crossed this line, largely due to lack of adequate funding for acquisition to begin with. 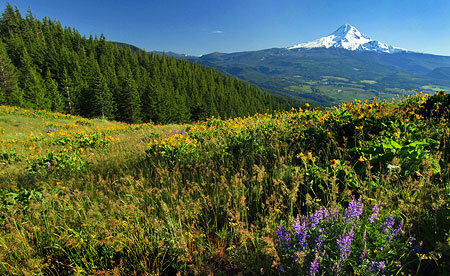 Someday, this will be an important part of the restoration vision of the Mount Hood National Park Campaign. But for now, simply stopping the bleeding is a more pragmatic goal. The Forest Service must receive more funding to accelerate private acquisitions. Trophy home gate on Hood River Mountain, where high anxiety accompanies country living for these dream-home dwellers. The State of Oregon and local governments can also help on this front. The state and local jurisdictions could offer a tax incentive for trophy-home owners in high-profile locations to eventually deed these homes to the public for demolition, removal or reuse as a public facility. In the meantime, the counties that issue permits for rural trophy homes can raise the bar for what they are willing to accept in engineering as geotechnical justifications for these projects. The Forest Service could assist the counties in providing an enhanced permit process, as a strategy for preventing the least sustainable eyesores from slipping through. Non-profit land advocates are already important partners in addressing both the short and long-term problem. Today, at least three of these organizations have begun to acquire private lands in the Gorge, and are advocating for expanding the scenic area boundaries to encompass more endangered lands. 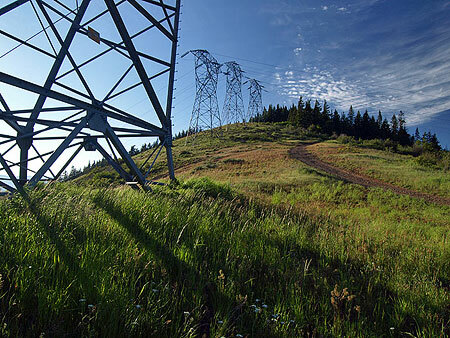 Since the non-profits are not bound by official designations, and could begin working immediately with landowners to acquire land at overlooked places like Hood River Mountain, they offer the potential to work far in advance of the federal bureaucracy. Each of us can help by supporting the non-profits who do this work. 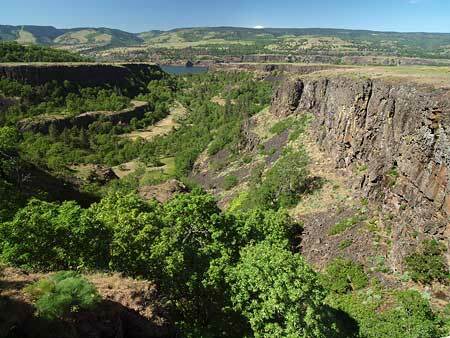 Most prominent are the Trust for Public Lands, Friends of the Columbia Gorge and the Nature Conservancy. You can find contact information for all three in this directory of organizations. Consider joining or simply contributing to one of these groups, and helping protect some of our most unique landscapes so that they may someday be intact or rehabilitated — as part of the Mount Hood National Park vision.